Hi Crafty Card Gallery followers! 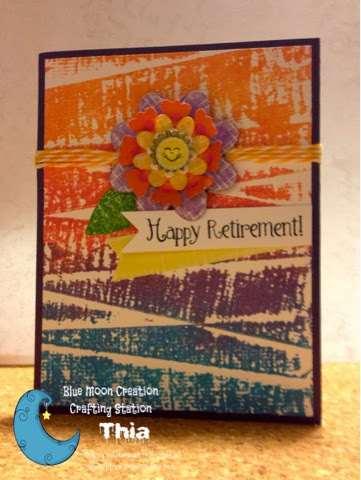 Thia here from Blue Moon Creation with a card I created to share with YOU! This card was created using duct tape. I wrapped tape in a zig zag pattern and then inked it with a variety of colors (tear drop ink pads). Then stamped it onto white Neenah cardstock. Pretty neat, right? I used some twine and created a flower from scraps that I had laying around. 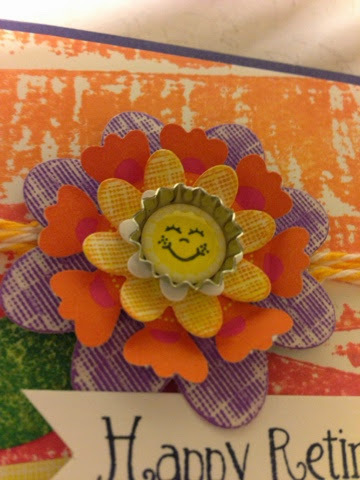 For the face of the flower, I used a mini bottle cap and some Spiced Sunshine Stamps. The sentiment is from Peachy Keen Stamps Hillbilly Holler Set 3, which I believe is currently on sale. So…I’m sure you all are wondering if my nails are really multi colored right now, since the color of our nails is this month’s inspiration for creating a card. They aren’t. I don’t wear nail polish these days. So, I decided to get colorful, since my nails are lacking in color! Thanks for stopping by and I hope to see you over at my blogs too! Let me tell you that this was so easy! Krazy Kreations was at the Expo showing how to make your own glitter paper and how to color on it. Well I was a chicken and bought the glitter paper and the Outline Stickers (these are by Elizabeth Designs). I mounted the outline stickers on the white glitter paper, got out my markers and went to down. I like my little blue bird of happiness. As soon as I took this picture, I filled out the card for the parents of my son’s girlfriend. They are so kind to our son, I wanted them to know we appreciate it. Thanks to Jenn at Crafty Card Gallery, Krazy Kreations and Elizabeth Designs for the inspiration and tools to make this card. Until next time…..
I’m Christina. I’m going to share I card I created from the Crafty Card Gallery Design Team. This months card challenge is colors: blue & tan. Here is my card…. Hi everyone! It’s me, Tonya and I’m here to share a card I created for Crafty Card Gallery. The theme for this month is blue and tan and this is my take on this month’s challenge. With all the craziness that has been going in the world I just wished that we could all get along and I thought this sentiment was perfect to convey what I wanted to get across. The base of the card is from K & Company’s Julianne card making pad. I love the fact that the base and the rubber stamp I used from 7 Gypsies are a perfect complement to each other. I used scraps of cardstock and scrapbook paper to frame the hearts which I cutout from the Sizzix Hearts and Brackets diecut. I free handed a banner for the sentiment and adhered all together. A very quick and simple card! If you have any questions please let me know. Thanks for stopping by, hope your Tuesday is wonderful and enjoy creating!! !